The Inspired by Nature exhibition on NOMA’s third floor includes an array of pottery, scrolls, and paintings depicting Japanese flora and fauna. 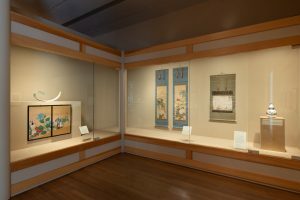 The arts of Japan are inseparably associated with nature, whether through themes and motifs associated with seasonal change or through objects whose shape, materials, or decoration reference the natural world. In both Buddhism and Shinto, Japan’s major religious traditions, nature is imbued with sanctity, and early ritual objects contained numerous botanical and zoomorphic motifs. Elements of nature emerged as discrete subjects of painting by the mid-thirteenth century. Over the course of the next several hundred years, secular paintings of pure landscapes or those featuring birds, flowers, animals, and insects, came increasingly into the mainstream. Inspired by Nature, a new exhibition in the Art of Japan Galleries, juxtaposes paintings from the seventeenth through early twentieth centuries with ceramics, lacquers, and woodblock prints dating from the nineteenth century to today. By presenting works in various media and created across several centuries, the enduring relevance and resonance of the physical world to Japanese artists may be seen. 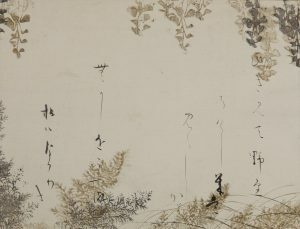 Originally part of a longer hand-scroll of selections from an early thirteenth century imperial poetry collection, the Shin Kokin Wakashu (New Collection of Poems Ancient and Modern), this segment embodies the elegant tension between the calligraphic word and the painted image for which these artists are renowned. Sotatsu’s designs serve as both frame and counterpoint to the varying size, thickness, and tonality of Koetsu’s calligraphy. The most recent work in the exhibition is by the contemporary ceramicist Shinya Tanoue (b. 1976), who for the last decade has explored the concept of the cycle of human life through his shell-shaped works. In Coquille, 16.1 Tanoue creates a twisting womb-like form with a rough, scored exterior and bright blue interior. The tension of interior and exterior, protection and exposure, coarseness and refinement is paralleled in the artist’s use of glazed and unglazed material. For Tanoue, the use of shell form does not simply celebrate the beauty and wonder of nature, but serves as a proxy to explore the complexities of life itself. Drawn from the permanent collection, Inspired by Nature: Japanese Paintings and Ceramics is on view in the third-floor Arts of Japan Gallery through June 2019.